Besøg Ming-gravene og Kinesiske Mur på Mutianyu, to Ming-dynasti-æra på verdensarvlisten i nærheden af ​​Beijing. 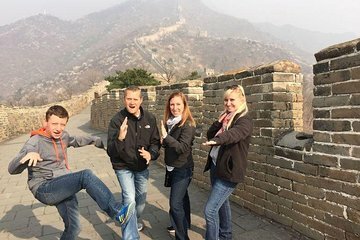 Din private guide giver en personlig oplevelse, som du tager i Chang Ling-graven, et imponerende kongelig gravkompleks for Yongle kejseren, og derefter til Great Wall på Mutianyu, der er kendt for sine Ming Dynasty-æra vagtårne. Overvejet to af Kinas mest berømte steder, viser Ming-gravene og Den Store Mur på Mutianyu fantastisk teknik og kunst fra århundreder siden. Dagsdagen tur starter med tidlig morgen afhentning på dit hotel i Beijing. Chat med din private guide, da din private chauffør rejser omkring 26 km (42 km) i den naturskønne en times kørsel, der fører dig til Ming-gravene. En af Pingstens store historiske vartegn, Ming-gravene (Ming Shisan Ling) blev bygget i begyndelsen af ​​1400-tallet til Yongle kejseren, der byggede Den Forbudte By. Din private guide deler historien om UNESCOs verdensarvssted, herunder historier om udgravningerne af disse kejserlige grave. Følg din guide til Chang Ling Tomb, en af ​​de bedst bevarede grave fra Ming-dynastiet, og beundre de store haller, der fører til Hall of Eminent Favors, som har en statue af Yongle Emperor og har en sumptuos interiør med kolonner lavet fra cedertræ. Næste op, slap af som du fest på en traditionel kinesisk frokost. Herefter stopper du på Longdi Jade Factory for at lære om jade og se en carving demonstration. Derefter går du til Mutianyu-delen af ​​Kinesiske Mur, som betragtes som en af ​​de bedste restaurerede dele af muren, men der er færre skarer der sammenlignet med andre sektioner. Mutianyu-delen af ​​Den Store Muren strækker sig omkring 2,5 km og ligger ca. 26 meter høj og 16 meter bred, der først blev bygget for omkring 1400 år siden og derefter genopbygget under Ming-dynastiet (1368 til 1644) som et militært alternativ til den store mur ved Badaling. Mutianyu sektionen kan prale med store militærtårne, flankeret af frodige træer på begge sider. Har mulighed for at køre op til toppen med svævebane (egen regning) og tage i flot udsigt over Stormuren, der strækker sig over bakkerne. På vej tilbage til Beijing stopper man ved en lokal butik for at se cloisonné-kunst fra Ming-dynastiet, lige fra farverige emalje skåle til intrikat designet vaser. Din tur slutter, når din chauffør og guide slipper dig afsted på dit hotel i slutningen af ​​eftermiddagen. As extensive travelers, we have had a lot of experiences on tours. As a visitor to a foreign country, what you expect is learning from the natives a little of their culture. This is the first time I write a review like this because I don't like to mess with someone's job, but as a client and a traveler I am very disappointed. This could be one more tour from the point of view of the tour guide, one more time in the Great Wall, but this is the ONE AND ONLY tour I would have to the Great Wall of China, our only experience, our unique day coming from the other side of the world. 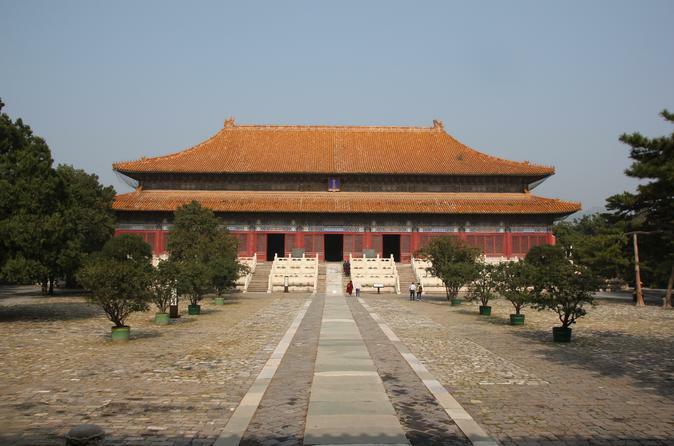 This tour was more like an expensive taxi to go to the Ming Tombs and the Great Wall alone. The tour guide barely talked to us during the times we were on the car on our way to the sites. As part of their job, you expect that a tour guide will be there talking a lot about the places, the country and the culture, at least that has been our experience in all tours around the world. Most of the time he kept talking in mandarin with the driver, he kept silence and even he fell asleep! During our way back from the Great Wall to the hotel, he was sleeping almost all of the way. If the man wants to be a tour guide, he needs to understand the needs of foreigners in terms of information. If we wanted to be quiet all the way, we would hire a taxi. Actually, we have had transfers and taxi drivers that have talked to us more about their country or even ask us about ours. In the tombs and in the wall he barely shared information, even if all these places hold centuries of history. At some moment, we passed by another tour guide as she was explaining a lot of what her group was seeing and I even told our tour guide: what is she saying? Just to provoke on him to explain more. He gave us a short explanation of what we were looking at, and the other guide was still talking while he was in silence. He looks like a nice person, but if he wants to pursue into tourism like a tour guide, he needs to continuously talk about all important stuff of China, history, the things or areas that we are passing by or at least talk to us of what we've seen already. The other thing is the driver. He kept driving like crazy and we felt so insecure. In one moment, he started driving through the emergency lane and he kept changing lanes without precaution, sometimes keep driving in the middle of two lanes. I have to say that the Tombs was a nice sightseeing and the Great Wall was a breathtaking moment, though, but yet we felt we could do it alone with a taxi as we only got a short piece of information in each place. We were extremely excited to visit this, since as part of the world history classes that we took during our school years, we learned and saw it in pictures. The lunch was nice. We asked not to be taken to any shopping tourist trap, and at least they kindly accept it. As I said, I was expecting more for that only day we would be visiting this part of Beijing. Coming far from America, is difficult to get to China again. As professionals in our own careers and as a recommendations for his future, we told the tour guide the things written in this message. We are letting you know so you, as a company, keep updated the trainings of your tour guides and make sure they are competent tour guides because, sadly, the image that we got from your country is not the best one. Cherry and our driver did a brilliant job. I had sprained my ankle that week and was getting around on crutches. Cherry arranged wheel chairs for me whereever possible and pushed me herself in many places. The tour was interesting and well timed. Highly recommended. Disappointed. Was really looking forward to this tour. Felt very rushed by our tour guide. She was pleasant but was more interested in getting us to the jade factory. High pressure sales tactic at the factory. Lunch at the factory was marginal. Didn't see any tombs at the Ming tombs. Wall was ok but weather was foggy so could see entire landscape. This was not the tours fault. Didn't really get much in terms of history. Wish another or different local tour company ran the tour. Had another tour the next day with a different local company via viator and it was great. The tour guide was good but the trip started out a little suspect as we had to walk a block or two to the tour van as opposed to being picked up at the hotel. Throughout the trip the driver's driving was more erratic than necessary and I actually felt like he had a death wish. The Great Wall location was good but we felt a little rushed. We walked as opposed to taking the gondola although it seemed as though they really wanted to push you towards taking the gondola. Lunch wasn't as good and I really didn't like shopping at the Jade Factory before eating lunch as by the time we were finished we only took 15 mins the food was cold. Oh yeah, this tour include the Pearl and Silk factory. Fabulous. We saw a lot and really enjoyed ourselves. This is a good tour because you have a private tour guide all to yourself. It is a hit or miss as to whether you get a seasoned tour guide who knows their history, or whether you get a young guide, like mine, that only touched on the basics. They give you about an hour to enjoy walking on the Great Wall, and you have your choice of taking the ski lift up and back, or you can take the ski lift up and take a toboggan ride down. I recommend the toboggan! It is great fun! Also, the traditional Chinese lunch provided at the restaurant was to die for. This part of the great wall was not so crowded. Nice ride. Very good guide. Definitely take the Toboggan ride on the way down the mountain. So much fun!